"Ordination is quite simply, the act of becoming a Minister with a specific ministry. There are many organizations and churches that offer ordinations; some are fee based while others are granted for free. These ministries can be Non-Denominational or fall specifically into a denomination or sect of religious teachings and beliefs." 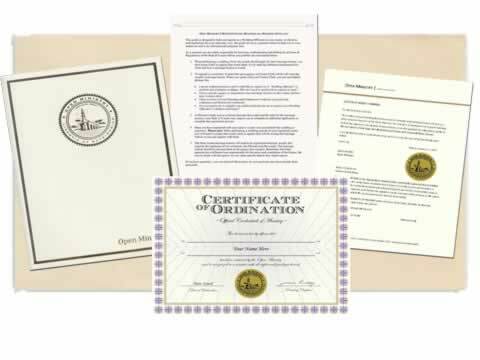 Most counties and states will require that you have registered and also have your official credentials as proof of your ordination. This can be in the form of the Ordination Credential and Letter of Goodstanding; which signify that you have completed the requirements set up by the ministry that has ordained you. The clerk may also have forms or fees that you may need to complete or pay to register as a Minister to perform weddings in their specific county or state. Since marriage laws are regulated by the states, each county may have different regulations and requirements for registering as a new Minister. What does being ordained offer me? As a Minister you are provided that same rights as “clergy." You may perform weddings, funerals, baptisms, baby naming ceremonies and all other services and rites that your ministry allows. Depending on your ordaining ministry, they may have their own restrictions. Open Ministry does not place restrictions on your ability to perform sacerdotal duties. Why get ordained with Open Ministry? The ordination issued by Open Ministry is granted to you for life, at no cost to you and with no monthly fees. We encourge all Ministers to request and have their Official Ordainment Credentials for their records. They can be requested through our online bookstore and are offered at reasonable prices for all income levels. We also offer specialty certificates and custom decorative marriage certificates that make great gifts for couples on their wedding day. Open Ministry is a Trusted Ministry, we have the highest ratings & reviews; with over 250,000 Ministers registered worldwide, we are here to offer the best products, service and support. We invite you to read the organic reviews of our ministry and products and become a Minister today.